Barb did not complain, never once did she say, “Why me?” or “Life’s unfair.” Instead, she focused all her energies on working to create awareness for this disease that afflicts a quarter million Americans a year, including 30,000 people – mostly women – who like, Barb, never smoked. To continue Barb’s passion for action, we’ve embarked upon a “race” to the cure – and we invite you to join us! The King5 news clip (NBC, Seattle, to the right) shows the success of Barb’s Beer in Seattle. Barb’s husband, Tom, created the Barb’s Beer Foundation with their daughter, Caitlin, son-in-law, Justin, and family and friends. The Foundation, a non profit 501c3 charity, lines up quality breweries in local communities to produce Barb’s Beer, a light-bodied American pale ale. Next, we recruit restaurants and taverns in those communities to serve Barb’s Beer. 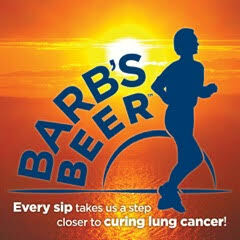 It’s the sale of Barb’s Beer at our partner restaurants and taverns that generates the funds. Those funds support Grace (cancerGRACE.org,) a charity established by Barb’s oncologist, Dr. Howard West, a physician at Swedish Hospital in Seattle and one of the country’s leading experts working for a cure. 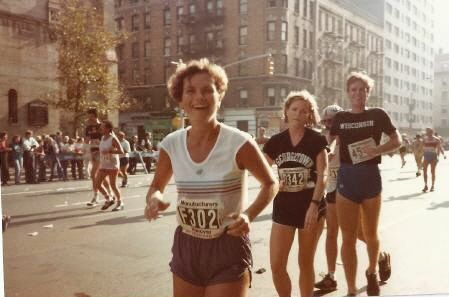 Barb was an avid marathon runner. 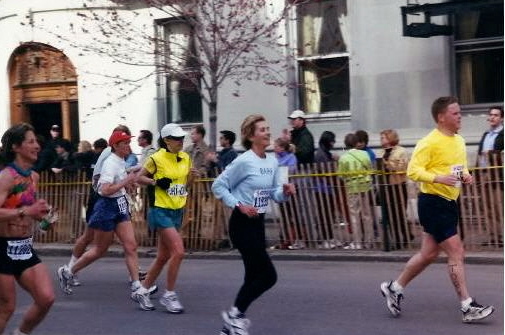 She and Tom ran more than a dozen marathons together, including New York and Boston. 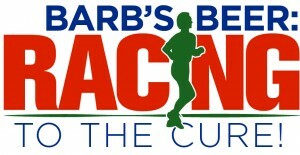 The Barb’s Beer logo is a silhouette of Barb crossing the finish line at the 2000 Boston Marathon, left. We invite you to join our “Racing to the Cure” team. You don’t have to be a runner in singlet and shorts to be a team member, you just have to want to cure lung cancer! 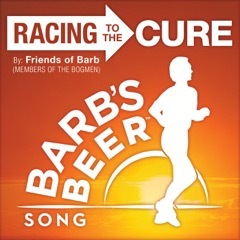 The recipe for Barb’s Beer was created by Chuck Hohing, a Bellingham, WA brewmaster. Boundary Bay, a leading brewery in the NW, brews the beer with careful oversight by brewmaster, Bryan Krueger. Read about our beer! Barb’s Beer is a great-tasting American pale ale. 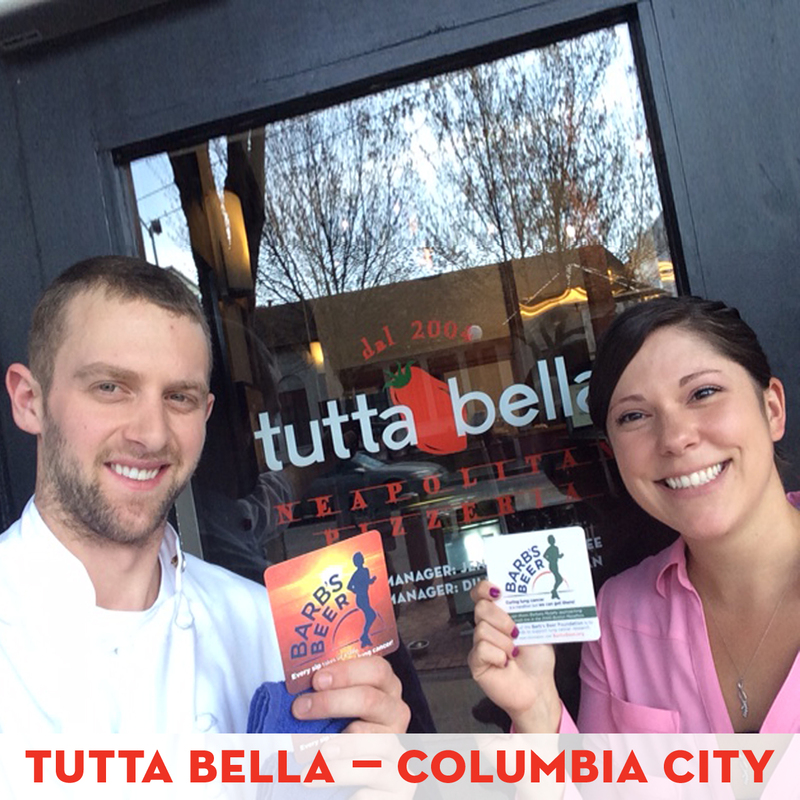 Barb’s Beer was “launched’ on July 1, 2014 at LaFiamma Wood Fire Pizza in Bellingham, WA, Barb’s favorite restaurant and the first to put Barb’s Beer on its tap. 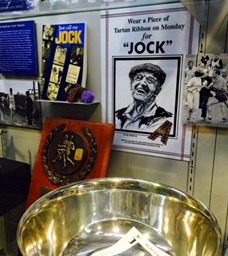 The coaster on the right shows the logo of Barb crossing the finish line at Boston in 2000. 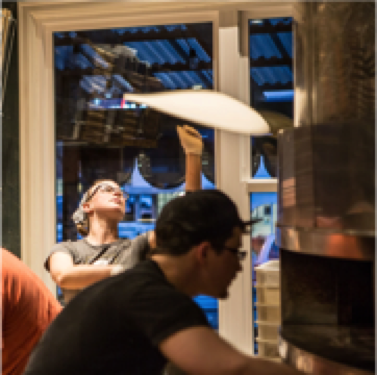 Led by LaFiamma, the “Proaction of Pizza” theme was picked up by Mike Mackley, GM of Serious Pie Westlake, a Tom Douglas restaurant in Seattle, and by Joe Fugere and his chain of Tutta Bella Neapolitan Pizzeria restaurants in Seattle. 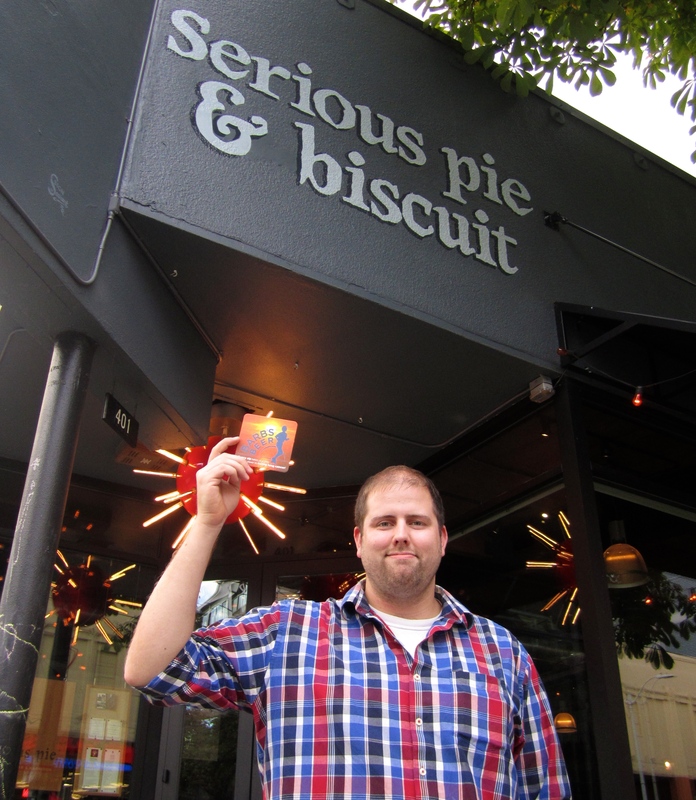 Other restaurants joined the cause – including Roberto’s Venetian Trattoria in Pike Market, Belltown Pub, Tulio Ristorante (Hotel Vintage,) Bell + Whete and Mars in the University district in Seattle and Cafe Akroteri and Keenan’s on the Pier in Bellingham. We’re grateful to all those who are helping us build a strong foundation for the Barb’s Beer campaign in the NW. This is giving us a platform to expand nationally, including NY and Boston, where we’re laying the groundwork. The more restaurant and tavern partners we sign up in communities across the US, the more we can help Dr West move toward his goal of crossing the “finish line” and ending lung cancer. THAT would please Barb no end! If you haven’t signed up to JOIN OUR TEAM, do so today! You’ll get our newsletter with latest updates and a chance to win prizes, including “Barb’s Beer26” Certificates at our partner restaurants and taverns. Just enter your email BELOW to sign up!